Sandy Maya attended the NBAF workshops in 2017 and was given the chance to be a guest performer at the 2017 Show in London. The request was for the performance to be a group piece and with that the "Bellyfairies" were created. The Bellyfairies have since performed at other venues and are going to continue being a troupe. What does it take to become a bellyfairy? You need to be reliable and attend regular practice and rehearsal sessions. ​You need to attend an initial trial rehearsal to ensure you are a good fit for the group. You need to be available to perform when the Bellyfairies are booked for a paid event. You may be required to pay a monthly membership fee which covers studio hire and learning routines for performances. The Bellyvibez Beauties came to life in May 2017. Sandy Maya ran a Lambada inspired workshop and the routine taught was performed at the very first Dance for Clean Oceans charity Hafla organised by Sandy Maya's Bellydance. Sandy Maya's workshop choreographies such as "Lambada" , "Big Spender" and upcoming workshops are performing under the name of "Bellyvibez Beauties". The name was inspired by the name of the studio Sandy Maya is teaching at: Vibez Dance Studio in Woodley. want to be part of the Bellyvibez Beauties? Wacika and Sandy attended their very first bellydance lesson together at the SMBA in July 2011. Their common interest in bellydance lead to a wonderful friendship and the passion to dance together. The duet's name "Pure Island Sugar" was inspired by both dancers having been born and raised on two seperate islands ( Cikka from Bali, Sandy from Sylt ) before meeting on yet another but bigger island "England". Visual Vibez is an intermediate level group which was created in January 2018. Students attending choreography terms on Wednesday lunchtime at Vibez in Woodley, England, UK ​are performing taught material as Visual Vibez. want to be part of the Visual Vibez? ​Choreography terms are held in Woodley every Wednesday from 12:15-1pm. ​The Magical Vibez are an open level group that welcomes beginners into their midst. want to be part of the Magicall Vibez? ​Choreography terms are held in Woodley every Monday from 12:15-1pm. 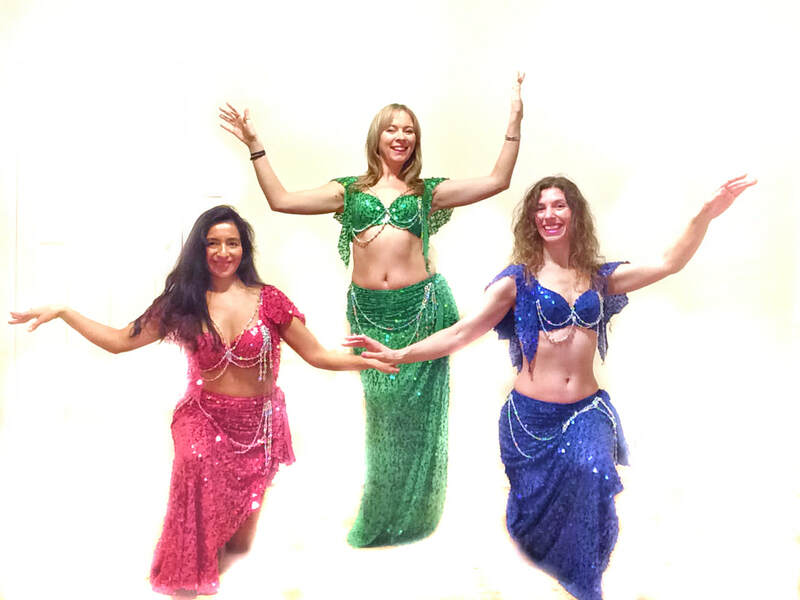 The Dazzling Vibez are a Show-dance trio performing Sandy Maya's choreos. want to be part of the Cabaret Vibez? Sandy Maya is planning to host workshops for advanced dancers. At the end of the workshop a selection of dancers are asked to perform in costume for a video shoot to capture Sandy's choreographies.